Yesterday, at an event organised by the Godrej Culture Lab at Vikhroli, I had the pleasure of listening to a talk by Tadao Ando, one of the world's greatest living architects. Not having been to Japan, my knowledge of his work comes mainly from books, but what I've seen in photographs and read about him has impressed me greatly. When I got to the venue half an hour before the talk was to start, there was a long queue of people waiting to get their copy of a big tome about Ando signed by the man himself. Each person bought a copy for 2500 rupees, wrote his or her name on a slip of paper, and handed these over once face to face with the master builder. He'd write down the name, make a little sketch, and sign. Architecture students obviously have much more money than art students. I can't imagine such a long queue to get a book signed by, say, Gerhard Richter, if he came to town. I could be wrong. The hall filled quickly, and some, like my friends Deepika and Shireen, found that keeping a placeholder such as a handbag on a seat did not guarantee that the seat would actually remain vacant. The auditorium had some 300 chairs, and by the time Ando began speaking about fifty people were standing at the back. He spoke in Japanese, and was translated by an Indian assisted by a White man who appeared part of the Ando entourage. He was by turns funny, moving and incisive. He also dropped a few names, highlighted his own charitable contributions and made what seemed a strong sales pitch to the assembled Godrej brass. Ando's approach is inherently modernist, but he imbues concrete with feeling and light and incorporates natural features into the complexes he builds. He balances needs of the market with a desire to preserve and reinvigorate nature; and employs art, culture and built heritage to attract people to locations and to make those who live and work in those locations feel emotionally connected to their surroundings. Should the Godrejes greenlight a Tadao Ando build, it will be the most exciting architectural project the city has seen since Independence. A bit about the Godrej land in Vikhroli: it is the biggest tract of its kind in the city and probably the most valuable privately-owned piece of earth anywhere in India. Back in the socialist days, during the Emergency to be specific, the Congress government passed a law called the Urban Land Ceiling Act. The idea was to take land from those who possessed more of it than they needed, and build on it homes for the poor and government employees. Nothing of the sort happened. Politicians made millions by not expropriating privately held plots, and by ignoring a provision that forced builders to turn over for public use 5% of all flats built on exempted land. In the 30 years that the Land Ceiling Act was in the books, the government acquired just 260 odd acres of vacant land, and received less than 2500 flats from builders from the nearly 2000 acres exempted. The law was repealed five years ago, but there's a lot of litigation related to it still being heard by courts. The Godrejes owned 3500 acres, and little of that has been taken over or sold. Despite a speeding up in construction, there's plenty left for an architectural landmark to be built. Back in the socialist days, two films were made about slum residents, the first independent documentaries about the subject to be widely viewed: Uma Segal's Shelter and Anand Patwardhan's Hamara Shahar: Bombay, Our City. Both films contrasted the massive unused land the Godrejes were sitting on with the paltry dwellings available to those who couldn't afford flats. Shelter, if I recall correctly, used title cards that said, in rapid succession, Godrej and Hoardrej. Having successfully kept the ULCRA demon at bay, will the Godrej clan now do something interesting with all that land, or will they follow every other developer in cramming it with malls, glass-front office towers and luxury residences? It's clear that a Tadao Ando project will not be as lucrative as one by Hafeez Contractor and his ilk. But hey, Parsis are different from Marwaris, Gujaratis, Sindhis, Marathis, Punjabis and all the rest, right? Parsis combine entrepreneurship with civic sense and good taste. They don't look solely at the bottom line. If Godrej will do nothing but build another Hiranandani complex, Indiabulls Centre or High Street Phoenix, there's truly no hope for this city. Tadao Ando took a helicopter ride over Vikhroli and its surroundings and was excited by the mangrove forest, seeing it as an anchor around which an entire complex could be designed. Another proposal currently doing the rounds, directed at the government rather than private sector, also involves the use of mangroves and the city's coastline. It is currently on view at NGMA, and has been designed by P K Das with the backing of Shabana Azmi, who worked with Das on the beautification of Carter Road. If something like the P K Das plan actually makes it past the drawing board, and the Godrej family bites the Ando bait, Bombay could be substantially improved five years from now. Here's hoping against hope. It would be exciting to see how modern India inspires Ando. His buildings have such a quiet, austere feeling about them. That's true, Rukminee. Ando said he'd visited India often, beginning in the 1970s, and had studied traditional architecture as well the Indian work of Le Corbusier and Louis Kahn. Should he be commissioned to design a complex here, he will be creating from a position of familiarity and understanding. Oh yes he would. Ahmedabad, where I spent my design school days has several buildings by the masters. I recall feeling awestruck on entering Le Corbusier's building for the Mill Owners' Association there. The building was not in use then but the way it opened up to the Sabarmati was simply breathtaking. Louis Kahn's IIM felt rather imposing if not forbidding. It'll be fantastic if Bombay can have a building by Ando that speaks to the Mangrove forest. In front of the one building I have seen of his, he had planted in a careful visual, dozens of cherry trees. 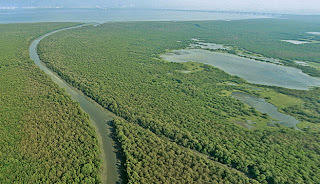 Well I hope that Ando and the Godrej's also realize the importance of the mangroves as they are! without a man/humans 'artistic' and 'carefully thought out aesthetic structure' coming up over them! Sparrow, there's probably a place for you deep in a forest somewhere. Your purist attitude to nature sits awkwardly in a city of 17 million people. You say mangroves are 'important'. Why are they important? Presumably because they help prevent flooding and harbour some living creatures. Well, if Tadao Ando or P K Das can preserve those aspects while also making mangroves central to citizens' leisure, it will only foster a better understanding of their worth. Ando has helped reforestation in a number of locations in conjunction with a careful reworking / preservation of built heritage and an understanding of modern needs. I find that a much more fruitful approach than the absolutism of 'leave nature alone'. We should have learned by now that to leave nature alone is only to leave it to people who would destroy it. The Godrej's have the wherewithal to leave that space alone, the point is do they really want to continue to exercise it!! Else we can justify the new 'aesthetic' built! My point is that there are spaces where built activity has already happened and those could be dealt with and 'made aesthetic' rather than looking into a verdant natural space with the idea of making it 'aesthetic'!! There's the whole length of the Mithi river to start with and i'm sure other river stretch's or topographies in the city. Maybe those places deserve 'reforestation' rather than entering and altering a verdant space and then after some years coming back with the idea of reforesting it! Also, you should get your 'presumption' of the importance of mangroves or may I even suggest, of nature itself - checked and corroborated a little before making such a sweeping statement. Nd i'm not going to say anything on ur comment on my nick and the ensuing reference to find a place in the forest!! It simply does not deserve a reply and you know it. OK, so maybe you should have clairified why you think Mangroves are important, rather than just repeating what you said in the previous post. Let me stop presuming and ask you straight: why are mangroves important? Also, it is presumptuous of you to think my reference to the forest had something to do with your nick. It had to do with your attitude, not your name. I've seen more sparrows in cities than outside, though their population's in serious decline.